This page discusses whether or not you should sell your house and tips on selling if that is the choice you make. You will notice that I refer to your "house" and not your "home". Once you make the decision to full-time, your home will become your RV, and the quicker you make that distinction, the easier it will be to move forward - you will have enough emotional ups and downs to deal with, so the sooner you get past this one, the better. The answer to that question is very personal. In our opinion the answer is "Yes". There are numerous reasons we believe the answer is "yes", but we also understand there are some very good reasons it could be "no". Let's explore both sides of the coin. What are good reasons to sell your house? What are good reasons not to sell? You can easily rent the property for more than the cost of any mortgage, taxes, maintenance, and property manager fees. Property management companies are highly recommended for absentee landlords with no rental experience. Seems like the balance is in favor of not selling, doesn't it? Not so fast buckaroo. Sure, if you are wealthy enough to keep the house and full-time, you might want to. Though not a guarantee (as folks have seen recently), real estate tends to be a very good asset to hold onto. But there are lots of full-timers on the road that CAN afford to keep a house and don't. Why not? Because the freedom of the full-timing lifestyle is what they love and having a house hinders that freedom. In this lifestyle, enough money to get by is important, but the desire to keep making more fades. It's about simplifying life. How much do you need to clear to be completely out of debt? Assuming you do not have an RV, do you have to wait until closing before you can purchase a rig? Make sure you understand your capital gain tax situation. Most likely you will not have to report a capital gain, but you may if you have a high dollar home or you have lived in it less than two years. What will you do if your house sells too quickly? 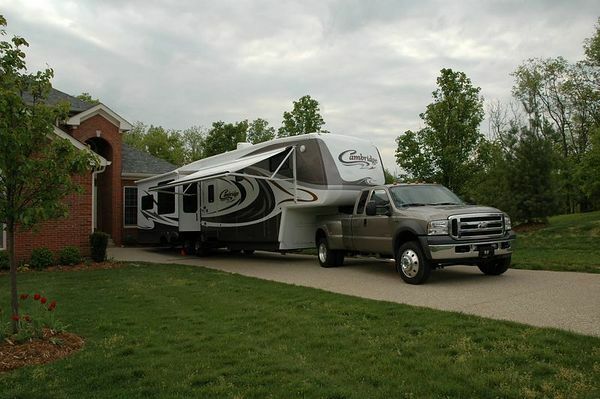 Can you move into your RV? What will you do if it doesn't sell? Since you will not have another house to move stuff into, make sure you give yourself enough time in your contract to get rid of furniture and stuff. Make sure you know how much your house is really worth - you can't sell it based on what you need out of it, as the market will bear what it is really worth. Can you sell it yourself or do you need to list it with a realtor? Is there a possibility you can sell it furnished? If so, it will save you lots of trouble. Consider an auction as an option. Try to take it with you, and then put part of it in one of the first five groups when it doesn't fit :) An auction is also an option that can generate some cash, but probably not nearly what you think it should. Of course, consider self storage for furniture and other items that you don't need on the road or just can't part with. We know many full-timers that maintain a storage unit for several different reasons. A lot depends on how much time you have and how anxious you are to get on the road. It's also a very, very emotional process. Be prepared. Going through the stuff can be worse than selling the house itself. You might want to take a look at our discussion of the Emotional Aspects of The Transition To Full-timing. That page addresses some of the emotions you may experience and let's you know they are normal. Once we made our decision to full-time and sell our house, we waited to see how things progressed. We figured we would have at least six months as we were giving six months notice at work. We decided to sell because we were adamant about going on the road without debt. Plus, it was not the type of house that was easily rented. So while we considered the renting option as a means of keeping the house just in case we didn't like full-timing and because it was appreciating quickly, we gave up that idea fast. Again, complete freedom is what we were after. We had enough equity to buy a fifth wheel and a truck with the proceeds after paying off the mortgage. So that became the plan. We put a For Sale By Owner sign in the yard in January knowing we needed a sale and closing by the end of July. Winter in Louisville, KY is not the time to be selling, but we had several lookers early. Since we bought it furnished less than two years prior, we wanted to sell it furnished, and we knew we would have capital gains issues if we sold it too soon. Ideally, we would sell it furnished and close in the middle of July after the two year capital gain period had passed. We also had agreed that we would list with a realtor if it hadn't sold by the end of April. In a twist of fate, we learned that a realtor friend of ours was showing some clients homes in our neighborhood. We made a call to him and set up an appointment for them to come look at ours - they were not opposed to buying furnished. One thing led to another, and I ended up calling the realtor and putting an offer on the table that made buying it furnished attractive to the buyer. We also offered to take a lower price for the real estate to help keep the buyers' property taxes down and give us some capital gains relief in exchange for a little higher, separate price on the furnishings. I also offered the realtor a higher fee than we discussed if the buyer accepted our proposal. They did. Now the point is that we were willing to give up some money on the front end in order to make the transaction go our way. Too many people make the mistake of trying to get just the right price and hold on too long continuing to pay a mortgage. Once we had the contract in hand and signed, we had to start thinking about our non-furniture possessions. We had thought we were going to have to auction everything, but fortunately we sold the house furnished. Then the buyers came back and requested that they be able to move in a month earlier than contracted. That added pressure, but we agreed. We started putting our stuff in piles: Donate to Goodwill, throw away, yard sale, storage, and take. Fortunately, we were taking delivery of our fifth wheel just before closing, so we were able to bring it home and load it up. We had to eliminate stuff from the "take it with us" pile. Also, you have to be very conscious of the weight you load into the RV, so consider weight when deciding on items to take - if it's heavy and does not serve an important function, leave it. When all was said and done we made a few trips to Goodwill, sold items to friends, gave items away, had three yard sales, and ended up storing a few precious items and old tax records with a family member. There is very little wall space in an RV, but we did manage to bring along two pieces of artwork to hang on the wall after agonizing about leaving them behind. We had to move into the RV three months before our jobs ended. But that turned out to be a blessing in disguise as we got to know the features and ins and outs of our rig before going on the road. We were very fortunate in our sale, but we did some fancy footwork to make it happen. Had we not been aggressive as sellers, we may still be sitting in Louisville. And take a peek at our Emotional Aspects of The Transition To Full-timing page. It may provide some comfort. If you need help with the sale of your house, to bounce some questions off someone, or someone just to talk to that has gone through the process, feel free to contact us!